The clavicles are involved to a variable extent in the majority of the inherited disorders with generalized hyperostosis and sclerosis, defective bone modeling, or both. 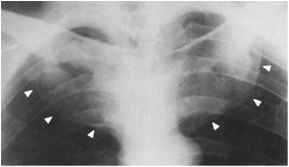 Clavicular broadening and thickening in such cases are usually bilateral and symmetrical, reflecting a systemic disorder. Yet the distribution of the defect within the clavicle does vary among different disorders. As a result, the clavicle can have a homogeneously broad and/or dense appearance or show involvement of individual portions (medial, central, or lateral). For example, in oculo-dento-os-seous dysplasia (OMIM 257850, 164200), a disorder with 'increased bone density and metaphyseal involvement' (International Nomenclature and Classification of the Osteochondrodysplasias 1997), the clavicles show a significant expansion of their medial portions, while the ribs are only slightly enlarged. Similarly, widening of the medial half of the clavicle is observed in endosteal hyperostosis (van Buchem, OMIM 239100), a disorder with 'increased bone density and diaphyseal involvement.' Although only rarely, involvement of the medial two-thirds of the clavicles is seen in diaphyseal dysplasia (Camurati-Engelmann, OMIM 131300). 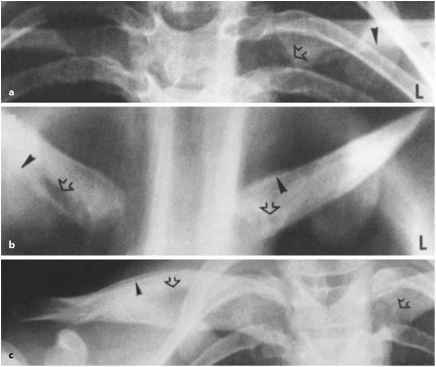 On the other hand,ho-mogeneous clavicular involvement occurs in several other sclerosing bone dysplasias, including dysos-teosclerosis, Pyle dysplasia (Fig. 2.35), craniodiaphy-seal dysplasia, and Lenz-Majewski syndrome. Lenz-Majewski syndrome (OMIM 151050), a rare disorder of unknown origin (all cases have been sporadic, but new mutation for a dominant gene has been suggested), is characterized by widespread sclerosis of the calvarium, skull base, and vertebrae; uniformly broad and thick clavicles and ribs; proximal sympha-langism; short or absent middle phalanges; osteo-penic, radiolucent metaphyses and epiphyses; retarded skeletal maturation; characteristic facies (large head, prominent scalp veins, large and floppy ears, hypertelorism); loose skin; and mental retardation (Lenz and Majewski 1974; Borlin and Whitley 1983). Homogeneous expansion and sclerosis of the clavicles are also features in the rare autosomal dominant distal osteosclerosis (OMIM 126250), a clinically silent disorder characterized by mild calvarial and skull base sclerosis, bowing and hyperostosis of the long bones in the forearms and shanks, sclerotic striae in the pelvis and femurs, and localized sclerosis of the vertebral pedicles (Beighton et al. 1980). of motion at the elbows, chronic diarrhea, and genitourinary abnormalities (Tsukahara et al. 1994). The triad of occipital horns, short and broad clavicles, and bladder diverticula is considered characteristic of this condition (Sartoris et al. 1984). Both vein varices and arterial aneurysms, the latter typically associated with Ehlers-Danlos syndrome types I and IV, can occur in the occipital horn syndrome (Mentzel et al. 1999). sacroiliac joints (Fig. 2.39). Increased uptake on skeletal scintigraphy and hyperostotic sclerosis of the cancellous bone on biopsy specimens are characteristic (Kohler et al. 1977; Goossens et al. 1985). Another sclerosing disorder affecting the medial end of the clavicle, without associated cutaneous lesions and therefore unrelated to the SAPHO syndrome, is condensing osteitis of the clavicle (Greenspan et al. 1991). This is a benign, self-limiting condition of unknown cause, showing a predilection for unilateral involvement of the medial end of the clavicle and most typically affecting women of childbearing age, so that it could possibly be related to osteitis con-densans ilii and osteitis pubis. Reports of affected men have also been published (Noonan et al. 1998) (Fig. 2.40). A history of stress or strain on the sternoclavicular joint (related to sport or occupational activities) is common. Pain and swelling over the medial end of the clavicle are frequent presenting symp toms. The pathological changes consist in thickening of trabeculae with eburnation of the cancellous bone and periosteal reaction. 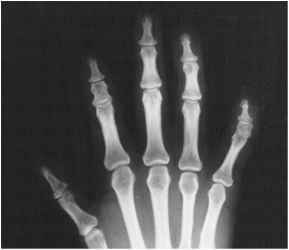 Plasma cell infiltrate has been reported within foci of sclerotic bone, suggesting a link with chronic recurrent multifocal osteomyelitis (CRMO) and POEMS (polyneuropathy, organomegaly, endocrinopathy, M protein dyscrasia, skin changes) syndrome, a plasma cell dyscrasia with skin lesions and sclerosis of bones (Resnick and Niwayama 1995). The sternoclavicular joint is not affected. Radiographs reveal bone sclerosis and mild enlargement of the sternal end of the clavicle, often associated with osteophyte formation. The differential diagnosis against ischemic necrosis of the medial segment of the clavicle (Friedrich's disease) may be difficult, although the different age distribution (children and adolescents most commonly affected by is-chemic necrosis) and the presence of a small defect of the articular surface in Friedrich's disease should allow differentiation between the two entities (Greenspan et al. 1991).